Well, the snow has ended. So the Winter Storm part of the weekend binge-a-thon is done too. Now, we are just down to the Second Chance/First Impression Binge and this is the first second chance we have to offer. Mars Attacks! 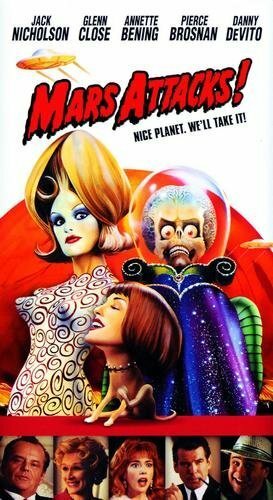 was a comedy alien invasion spoof film from the mind of Tim Burton that came during the mid 90s and I disliked it quite a bit the first and only time that I saw it on VHS. Finding it now on Amazon Prime, I decided that this would be the next installment in the binge. And I did find it more entertaining than I did on the first viewing. There are a ton of actors appearing in here and most of the big names do not last for too long. There are a bunch of storylines that really make little to no sense. It is just a fun movie where a bunch of little green jerks from Mars came to the planet earth and tried to take it over. Jack Nicholson was the President of the United States (and a weird second role of a Vegas businessman that really had no reason). Glenn Close was the vapid FLOTUS. A group of actors (Michael J. Fox, Pierce Brosnan, Danny DeVito, Martin Short, Sarah Jessica Parker, Jack Black) are here basically to see how the Martians kill them. The main heroes of the piece is Jim Brown, Tom Jones (playing himself), Lukas Haas and Sylvia Sidney. Not exactly the group of names when matched up with the other actors in this movie. That was probably the idea here and Mars Attacks! made these deaths funny a lot of the time. The Martians themselves were fairly ridiculous too. Certainly, one of the standout performances was Lisa Marie as “Martian Girl” who is able to infiltrate the White House with horny chief of staff Martin Short. Her weird way of moving created the most memorable of all the characters involved. While this is nothing unbelievable, I found it more entertaining this time around and the first film of this binge that is going to receive a positive review. One out of three so far. Getting out this afternoon for Glass. Binge will continue later this weekend.